The little twist between Clary and Jace really pissed me off! Why?! Why?! Don't worry, I won't tell you guys what it is. You have to read it to find out. My lips are sealed. hehe. Trust me if you are a fan of Clary and Jace you'll be just as disappointed and mad. Why'd Valentine have to ruin it! I still don't believe Valentine. I'll need Jocelyn to prove it. Even then I won't be too sure. Maybe they'll convince me in the next installment. 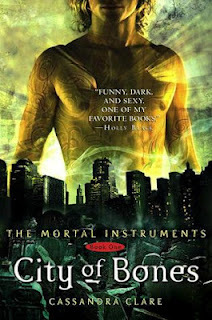 Cassandra Clare has great narrative skills. The story was told wonderfully. Her word choice was great. It wasn't too simple like a children book. Nor was it too complicated like... A dictionary? :P OK, OK. Like... Shakespear? I can't really think of any... It was somewhere in the middle and it sounded totally natural. Good job Cassandra! Did this book meet my high expectations? I met a great deal of it, though it could be better which is why it is only 4 stars not 5. I really wish she hadn't made that little twist between Jace and Clary.